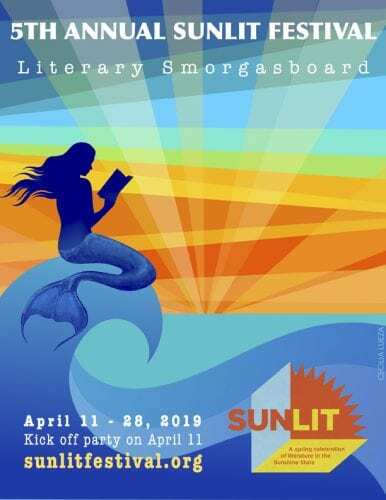 The fifth annual SunLit Festival brings together cultural organizations, writers, artists, and businesses for 18 days of “litertainment.” This year’s SunLit Festival activities will begin with a kick-off party from 7 to 9 p.m. at the Chihuly Collection on Thursday, April 11. Produced by Keep St. Pete Lit, the celebration of literary arts will continue until April 28. Activities will take place at various locations around St. Petersburg during the Festival. Events range from conversations with authors to interactive storytelling to poetry at The Dali and more. Find the complete list of events at SunLitFestival.Org. SunLit Festival is a confederation of like-minded literary, cultural, and civic organizations coordinating their individual efforts for the common goal of advancing the enjoyment of books, reading, writing, and the classic art of letterpress printing. Literature represents a moment in time. It is an exploration of our history, an expression of our experiences and of the life that surrounds us. It is a discussion of who we are, how we got that way and what choices we can make to shape our future.